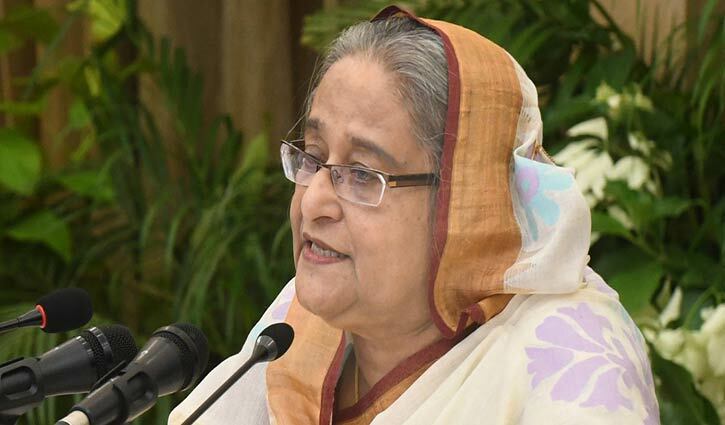 She said this at a discussion organized by Bangladesh Awami League on the occasion of March 7 at Bangabandhu International Conference Centre (BICC) here in the capital on Thursday. “Every word, every sentence of the speech inspires us afresh— the March 7, 1971 speech of Father of the Nation is a never ending appeal. The speech will give inspiration to the freedom loving people across the globe,” Hasina said. “The March 7 speech served as the immense source of inspiration for freedom fighters as it had been played countless times at every nook and corner of the country as ‘fiery voice’ (Bojro Kontho) during the Liberation War,” she apprised. Each of the words and sentences of the March 7 speech carries significance, she said, adding that she found each of the sentences of the speech as quotations when she was asked to find quotations from the historic speech. “I have found 41 quotations from the speech,” she added. Referring to imposition of a ban on the playing of the speech for 21 years, Sheikh Hasina said Yahiya Khan had been compelled to play the March 7 speech on radio on March 8, 1971, the next day after delivering the speech, due to mass upsurge. But, Ziaur Rahman had banned playing of the speech after assassination of Father of the Nation Bangabandhu Sheikh Mujibur Rahman toeing the Pakistani junta’s disliking for the speech. “But, they had failed to bar Awami League leaders and workers from playing the March 7 speech. And for this reason, many of the leaders and activists of the party had been killed and tortured,” she regretted. She said the post-1975 governments had not only banned the March 7 speech, but also banned the portrait of Bangabandhu alongside ‘Joy Bangla’ slogan. She said no other speeches in the world had been played so many times likewise the March 7 speech. Those who will run Bangladesh in future will also stand inspired by the Bangabandhu’s historic speech as it will inspire countless generations of Bangalees to face all odds and hold their heads high in the world, she mentioned. The United Nations (UN) recognized the March 7, 1971 speech and included it in the Memory of the World International Register, a list of world’s important documentary heritage maintained by the United Nations Educational, Scientific and Cultural Organisation (UNESCO), she rejoiced. “Father of the Nation Bangabandhu Sheikh Mujibur Rahman might be the world’s only leader who transformed a non-cooperation movement into a war of independence by uniting all the people of the country,” she said. “In the history of the globe, many world leaders triggered non-cooperation movements. But none of them could lead the movements towards successful ends excepting the Father of the Nation,” she continued. The premier asked the leaders and activists of the Awami League to read “Atmojiboni” (“The Unfinished Memoirs”) and “Karagarer Rojnamcha” (“Diary in Jail”), written by Bangabandhu Sheikh Mujibur Rahman, and “Secret Documents of Intelligence Branch on Father of the Nation Bangabandhu Sheikh Mujibur Rahman” to know the real history of the Liberation War. “Fourteen editions of the book on “Secret Documents of Intelligence Branch on Father of the Nation Bangabandhu Sheikh Mujibur Rahman” will be published. Two of the 14 editions have already been published,” she informed.